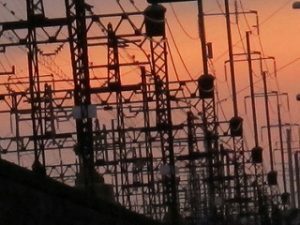 Adam, Brian and Jeff discuss the electrical grid in this episode of The Engineering Commons. The difference engine, conceived of by J. H. Müller in 1786, and designed by Charles Babbage in the 1820s, is often considered the world’s first computer. Brian notes that electric furnaces are increasingly used in steel production. Adam and Brian discuss “knob and tube” wiring, an early standard for electrifying residential buildings. The first central power station in the United States was New York City’s Pearl Street Station, which began generating electricity in 1882. DC electrical systems continued to operate in New York City until 2007. Three-phase induction motors were introduced into the marketplace by General Electric in 1891. A polyphase arrangement is often used for electric power transmission. Once quite popular, synchronous electric clocks depend upon the AC power frequency to keep accurate time, requiring power utilities to maintain a precise average frequency. Electrical power grids have to respond to sudden changes in electrical demands, which may occur when large populations simultaneously take similar action due to the end of a sporting event or television show. A significant power outage, starting in Cleveland, Ohio, affected the Northeast United States in 2003. T. Boone Pickens has been promoting wind power in recent years. Thanks to rik-shaw (blekky) for use of the photo titled “Bridgeport, CT Dec. 2012.” Opening music by John Trimble, and concluding theme by Paul Stevenson. Easiest way that I imagine the electrical grid’s frequency response is as a very large network of motors (the generators) whose shafts are all connected nearly invisibly (as electrical potentials in inter-connected wire networks). If a generator is connected to the grid not in sync, the grid will yank it into phase in a hurry. Imagine a two motors with a clutch between them. If you engage the clutch, thereby coupling the shafts, while one is spinning at a different speed that the other than they will very quickly and violently reach some equilibrium point. Now imagine trying to do this with a bigger motor you can possibly imagine (the interconnected grid), and a generator, the grid wins the fight. With the idea of motors connected invisibly, frequency drops from large loads become more obviously understood: changing load suddenly on a motor causes it to change speed. Generators vary the excitation to the armature to make different amounts of power, this increases the mechanical load on the drive shaft and the prime mover is throttled up to generate more shaft torque. If you were to drop a generator suddenly off of the grid, suddenly you have less net HP available to do the same amount of work (grid load). So everything slows down (the frequency on the grid drops). Same thing happens if a large load is added to a grid (even locally). Voltage drops because of the frequency drop, power goes down, and the amount of work done by the grid becomes equal to the power going into the grid from the generators. Part of startup procedure is to spin the turbine (and generator) shaft up to 3600 rpm (60 times per second!). The armatures of the turbine are excited with grid power (except during a black start), so you are already in sync. Since you applied a load to the shaft, you slow down slightly and add more steam into the turbine to compensate. Bringing up the excitation voltage in the armature occurs in sync with adding more steam to the turbine (they are governed to always run the shaft at 3600 rpm). The ramp rate (first derivative of wattage output) of the unit depends on how tolerant your mechanical systems at the plant are (correctly called at 1:01). Coal plants (even old ones) today do actually load follow to stay competitive in today’s de-regulated market. Less heat input into the boiler-less steam (lbs/hr) through the turbine-less shaft torque-less power out. Nuclear plants do actually follow load (check instantaneous load levels here:http://www.nrc.gov/reading-rm/doc-collections/event-status/reactor-status/2016/20160908ps.html), though most of them don’t change load as often as coal units since their cost/MW is very low. Gas generation is starting to cut into this, however. Nukes move the control rods in or out to slow or speed the nuclear reaction, which changes the thermal output of the reactor. Same as before, less steam through the turbine and you make less power. Jeff’s point about frequency difference is valid, things do run at marginally different frequencies across large distance, and it goes back to capacitance and inductance in the electrical transmission system. Large conductors (wires) running next to each other separated by an insulator (air) behave like capacitors. Not covered today is the real head scratcher for most mechanical types, VARs or reactive power. My wrench-turner (mechanical engineer) understanding of the way that things work anyway. I’ve been lucky to spend some time in a coal fired power plant as part of my job, and am continually amazed that I can just flip a switch and the lights come on without fail. When I was a young Marine stationed in Okinawa Japan I connected 2 generators out of phase. I was operating electricity for an expeditionary runway that my unit had made to allow pilots to practice landing and taking off. When the jets were inbound we were supposed to fire up the generators and the tower lights. I had 2 60kw generators, the runway apparatus required about 70kw 3 ph of power to work. In order to parrallel the two generators there are what is called synchronizing lights, befor I would contact the generators together I would plug a cord between them and the lights would then blink on both generators, the closer they would be into sync the slower the lights would blink when the lights shut off at the same time I would throw the switch. I had a few jets inbound, I fired up the 2 gen sets. The lights on one of the generators wouldn’t come on! I was flipping out because I only had a few min. Befor the jets would be there. I have a solid understanding of the sign waves and I knew that if they are close enough and the speed was close they would still contact and then even out. I did what made sense in my head, I limited the variables by getting the speed right, I hummed along with the two generators to use the sound to try to determine the speed was the same. I through the switch….I was waaayyy off. One generator essentially fed the other and stopped the John Deere engine dead in its tracks. The generator damn near flipped over. It tipped itself up on one skid and fell back down. At this point I was swearing at the world thinking why would they leave a 19yr old in charge of this. But the jet was still coming so I fired the generator back up and did it again…it was a little violent but it worked!! I thought you might enjoy the story as you were looking for accounts of this happening.